"Spider Woman instructed the Navajo women how to weave on a loom which Spider Man told them how to make. The crosspoles were made of sky and earth cords, the warp sticks of sun rays, the healds of rock crystal and sheet lightning. The batten was a sun halo, white shell made the comb. There were four spindles: one a stick of zigzag lightning with a whorl of cannel coal [black jet]; one a stick of flash lightning with a whorl of turquoise; a third had a stick of sheet lightning with a whorl of abalone; a rain streamer formed the stick of the fourth spindle, and its whorl was white shell." --Epigraph to Spider Woman: A Story of Navajo Weavers and Chanters, by Gladys A. Reichard, first published 1934, republished by Rio Grande Press, Inc., Glorieta, NM, 1968. [The whorls of the four spindles are the stones of the four directions, and also of the four sacred mountains in those four directions that surround and protect Dine' Bike'yah ("Where the People Walk"), Navajoland, their homeland. The art of rug weaving and care of Churro sheep reciprocates the quality of Diné relationship with nature and cosmic order. It is this sovereign way of life acquired through millennia of sacred songs and prayers that The Holy Deities, Spider Man and Spider Woman, bestowed upon the Diné. The Diné, meaning “The People,” yearned for creative endeavors to sustain their minds and fill a void in their livelihood. 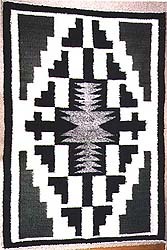 Inherent in the beauty of rug weaving is the artistic achievement reflecting every weaver’s frame of mind, creating designs of continual mathematical movement and regeneration of symbolism acknowledged for the Diné. Spider Man and Spider Woman’s gift included the powerful weaving implements: the spindle, cedar combs, battens, and slender wooden rods, skeins of wool, twine, warp, and loom. The loom itself is a sacred living phenomenon of endurance and passive power found in female and male entities, negative and positive factors as well as in water, air, and land. All of these forms are necessary for completion of a rug and to balance the mind. 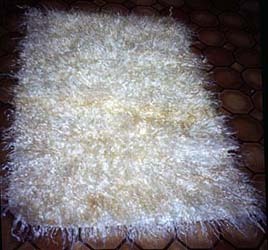 Only then is the rug finished in all its sacred beauty and power of the weaver. Verna Clinton, from Star Mountain, Arizona, is a Diné educator, teacher, Arizona State University Liaison/Advisor, curriculum developer, artist, and author. 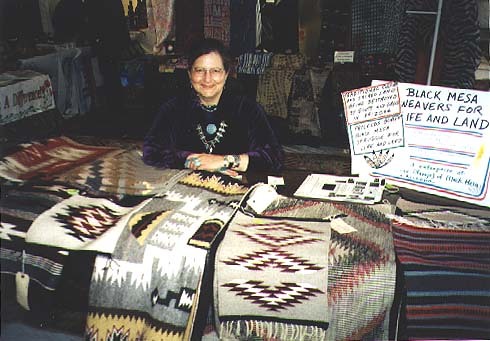 She is a member of the Black Mesa Weavers for Life and Land Advisory Council/Board of Directors. Her late father was a Hataalii (medicineman), and her mother is a weaver and devoted raiser of Churro sheep. A sixth-grade teacher in Chinle, Arizona, Ms. Clinton’s research interests include the education of Native gifted children, Diné land and relocation issues, and study of the Diné-Hopi Awatovi and Tobacco clans. 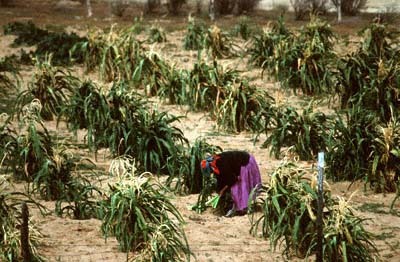 ©2006 Verna Clinton and Black Mesa Weavers for Life and Land, Inc. Translated by Verna Clinton from her original Diné. "The spindle, used to spin wool and mohair into yarn and warp strings, was constructed in the fourth world. ... The top or tip of the spindle is the center of the zenith; the bottom point is the nadir. The disk is the earth." 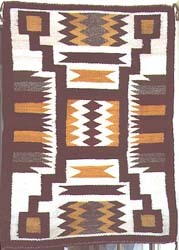 (Wesley Thomas, weaver, "Personification of Navajo Weaving," in: Woven by the Grandmothers, National Museum of the American Indian, NY, 1996, p. 40). Ahe'hee'--our profound thanks to all the people who have supported and encouraged us. With your help, there is hope for the future of the Dine' on Black Mesa--for the water, land, livestock, and lifeways...and for the well-being of all the people--Dine' and Hopi both--who share this sacred place. 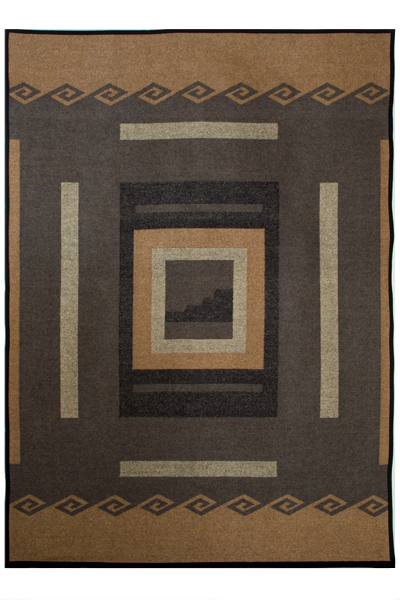 Your purchase of these weavings, wool, and other products from the Black Mesa Dine' will help make their hopes and dreams for economic self-sufficiency and community development a reality. Mission: Our work is grounded in the knowledge that human and environmental justice are inseparable. THANKS TO YOUR SUPPORT THROUGH SALES, DONATIONS, AND PRESOLD FLEECE, WE WERE ABLE TO HOLD OUR 8TH NAVAJO-CHURRO WOOL BUs IN JUNE 2010. THANKS ALSO TO THE GENEROUS DONATION OF AN ANONYMOUS DONOR, AS WELL AS SALES --WHICH HAVE BEEN VERY SLOW BECAUSE OF THE RECESSION/DEPRESSION THAT BEGAN IN 2008 -- WE WERE ABLE TO HOLD OUR 9TH NAVAJO-CHURRO WOOL BUY IN JUNE 2011, PURCHASING MORE THAN 2,600 LBS. OF HIGH-QUALITY PURE CHURRO. 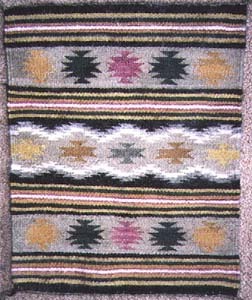 Thanks to the support and generosity of the Christensen Fund, the San Jose Museum of Quilts and Textiles in San Jose, California, sponsored the 3rd and final edition of the Black Mesa Blanket, produced by Pendleton Woolen Mills (same colors as 2nd ed.). YOU MAY PURCHASE THIS BLANKET DIRECTLY FROM THE SAN JOSE MUSEUM OF QUILTS & TEXTILES for $270 (members; or $300 for nonmembers). Call Teresa Magallon at 408.971.0323 x. 14 to reach the gift shop or go to http://www.sjquiltmuseum.org There are only seven numberd 3rd ed. blankets remaining in stock: numbers 61, 64, 68, 96, 98, 99, and 101. Meanwhile, please see the weavings available below, and visit our "WOOL" for sale page to see the handspun yarn and new mini-mill (indigenous, nonprofit) Churro yarns we have in stock. TO OUR KNOWLEDGE, WE ARE THE ONLY NONPROFIT, FAIR TRADE ORGANIZATION BUYING CHURRO WOOL DIRECTLY FROM THE DINE' SHEPHERDS IN ANY SIGNIFICANT QUANTITY--COMPARED TO THE LOCAL DEALER MARKET PRICE OF ABOUT 5-10 CENTS/LB OR LESS. WE ARE ALSO, TO OUR KNOWLEDGE, THE ONLY NONPROFIT FAIR TRADE INDIGENOUS ORGANIZATION THAT POSTS HOW MUCH THE WEAVERS AND HANDSPINNERS ARE PAID FOR THEIR WORK (they set the prices, which are less than retail), AND HOW MUCH IS PAID TO THE SHEEP RAISERS FOR THEIR RAW CHURRO WOOL. THIS IS THE CYCLE OF SUSTAINABLE LIFEWAYS WE ARE WORKING TO MAINTAIN. "...Churro sheep were rescued from near extinction by the Navajos. Isolated in the far northwest corner of the reservation, traditional Navajos have kept the breed alive and have recently begun a renaissance of traditional weaving. Weavings for sale -- (click on thumbnails to see larger images, details, and prices). 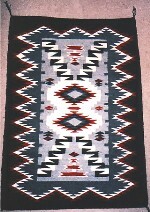 A Navajo weaving, circa 1860, was appraised on PBS national television for $350,000-$500,000. 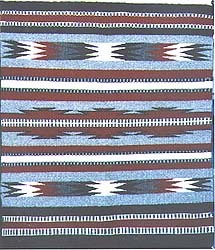 At a January 2002 "Antiques Roadshow" in Tucson, Arizona, a striped blanket that had been kept folded by its owner over the back of a chair was identified as an early Navajo "chief's blanket." 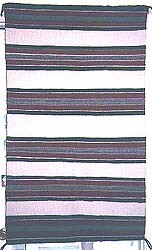 Powerful, wonderfully balanced striped designs woven on vertical looms are among the earliest Dine' wearing blankets, and the extraordinary "chief's blankets" were highly valued in trade with other American Indian tribes. 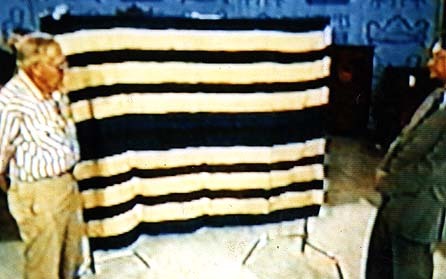 The photo below was taken from the TV screen when "Antiques Roadshow" was shown on WGBH-TV, Boston, Mass., as the blanket was being appraised. 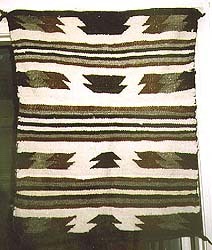 On Black Mesa today, the same quality of rare Churro wool is being bred, shorn, washed, carded, spun, dyed, and handwoven on the same kind of vertical loom as this 150-year-old $350,000-$500,000 blanket. 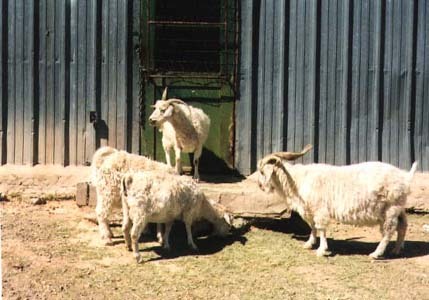 A little early for our wool buy, some goats wait outside the door to the hay shed, where the Hardrock Chapter is storing and selling hay to area residents. They're eating a bit of hay remnants near the door (June 22, 2006). We held our 4th, 5th, 6th, 7th, 8th, and 9thannual Navajo-Churro wool buys in June 2005, 2006, 2007, 2008, 2010, and 2011 at the Hardrock Chapter, where we bought about 2,400 lbs. (in 2005), 2,000 lbs. (in 2006), 2,000 lbs. (in 2007), 2,314 lbs. (in 2008), 3,000+ lbs. (in 2010), and about 3,000 lbs. 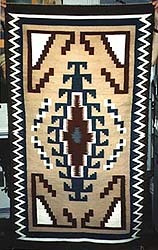 (in 2011) of rare Navajo-Churro wool, and continue to receive new weavings, along with photos of the land, people, and sheep from which they came. 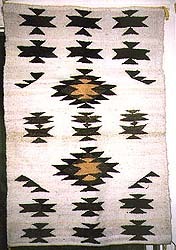 SEE WEAVINGS POSTED BELOW. In 2003, thanks to a grant from the Greenville Foundation, we installed a solar-powered windmill to pump livestock water for a family raising Churro sheep and angora goats, and a second one will be installed at another homesite this summer. At last reports, the solar well was pumping abundant water and the family no longer had to drive to haul drinking water in barrels for livestock 20 miles round trip. The same savings in energy and time will become available to the second family. More and ready access to water means more animals can be sustained as well as crops, herbs, and dye plants--using renewable resources, such as sun and wind. We hope this project will grow throughout the Black Mesa region, and can serve as a model for sustainable agriculture throughout the Southwest and the United States. 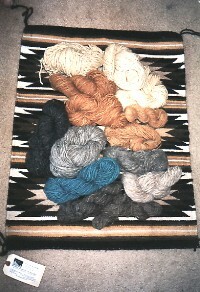 Our profound thanks to all our customers who have bought weavings, wool, handspun yarn, and other items. PLEASE CHECK OUT SOME SPECIAL SAVINGS! Fair trade prices are paid to the weavers who set their own prices, which are published with each weaving -- and all proceeds from sales go to support and sustain the work of our nonprofit organization. To the best of our knowledge, we are the only fair-trade nonprofit organization that posts how much the weavers, handspinners, and sheep raisers receive individually for their work. We have been doing this since we started our enterprise almost 15 years ago, because we believe it is important that the public know how much the makers of these items receive for their work, prices that they set themselves and that are based on the reality of fair-trade living costs in the USA. Many weavings we've sold are on the individual pages that link from these thumbnails (of weavings currently in stock or on hold). 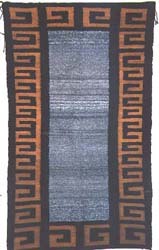 If you see a weaving that you like and has been sold, another similar one can likely be commissioned. Here are weavings currently in stock. A few that were recently returned to a weaver at her request are also listed, and may still be available, or similar ones may be commissioned. 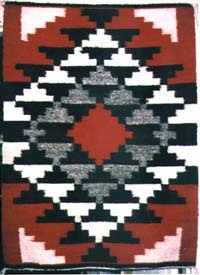 All the Diné rug weavers hope to express their philosophy and spirituality in mathematical art design. 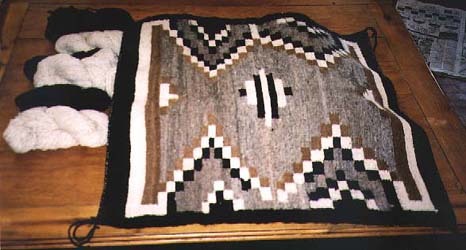 In the region of Star Mountain, Diné weavers incorporate Churro wool into rugs of art only an exclusive few can artistically develop. The love of weaving all begins for a child from within their mother’s womb. They first hear the rhythmic sounds of the weaving battens beating on the upright loom. The resonance of vibrations from the weaving implements soon becomes familiar, and is the foundation of that child’s emergence and spirituality. 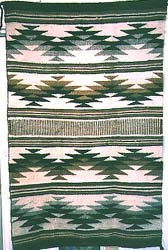 From time immemorial, Diné matriarchs passed down their rug weaving skills using the principles of geometry, symmetry, lines, shapes, hues, and tones without any formal training. Inherently, rug weavers learned through the hard and often tedious work of wool preparation—from shearing the wool, carding, spinning, and dyeing the skeins of yarn. They often choose vibrant vegetal dye colors, inspired by their environment, the canyons, painted deserts, birds, and wildlife to express what they see and to convey their mathematical magic in a rug. The learner steps into this systematic process with precision and skill, producing a one-of-a-kind weaving—and it is finished in beauty. Verna Clinton, from Star Mountain, Arizona, is a Diné educator, teacher, Arizona State University instructor, curriculum developer, artist, and author. 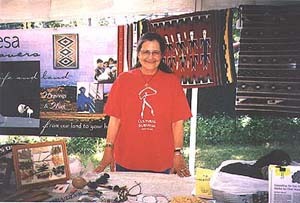 She is a member of the Black Mesa Weavers for Life and Land Advisory Council/Board of Directors. Her late father was a Hataalii (medicineman), and her mother is a weaver and devoted raiser of Churro sheep. A sixth-grade teacher in Chinle, Arizona, Ms. Clinton’s research interests include the education of Native gifted children, Diné land and relocation issues, and study of the Diné-Hopi Awatovi and Tobacco clans. MBM-519, 520, 521, 522. Anna Jean Bahe. (MBM-521 and 522 are sold). "That opening, when you get up to the end, up at the top, you're supposed to let your thoughts go out, so your thinking is not closed up, so you put an opening in there. That's what my mom told me, to put in that opening so you're not closed in." *sometimes called the "weaver's pathway" in English; but "opening" is the more accurate translation. "We live in a world in which we need to share responsibility. It's easy to say 'It's not my child, not my community, not my problem.' Then there are those who see the need and respond. I consider those people my heroes." (Fred Rogers, host of "Mr. Rogers Neighborhood," in an interview (from the Boston Globe). Mr. Rogers died on February 20, 2003, at the age of 74--he was a good man. On the left in the photo above is the sample prototype (female side) of the1st ed. 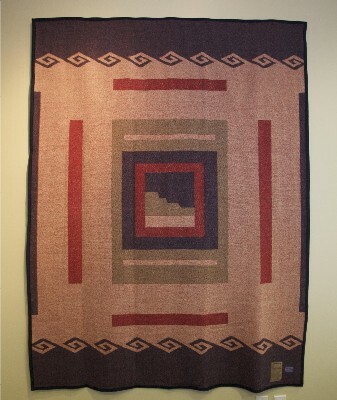 of the "Black Mesa Blanket"(tm) designed by the Dine' and produced of 100% Navajo-Churro weft together with Pendleton Woolen Mills in a limited edition of 250, cosponsored by the Navajo Nation Museum in Window Rock, Arizona, and the Museum of Northern Arizona, in Flagstaff. A historic first. The blanket is 80 in. x 64 in., in black, tan, gold, and grey. 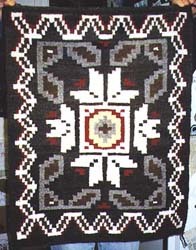 Black Mesa Blanket, female side, 2nd (and 3rd) limited numbered edition, 80 in. x 64. in. Nos. 1-87 cosponsored by and available at the Heard Museum, Phoenix, Arizona. Deep midnight blue, rich "Ganado" red, warm wheat, and warm tan, 100% Churro weft from our 2008 7th Annual Black Mesa Navajo-Churro Wool Buy, containing entire 2008 and some 2007 white Churro shearing (©2008 Black Mesa Weavers for Life and Land, Inc. All rights resserved. Photos of 2nd ed. 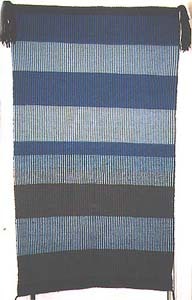 blanket courtesy Heard Museum. 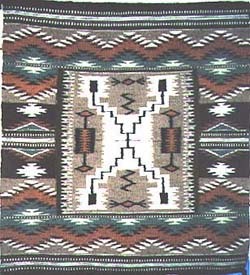 Produced by Pendleton Woolen Mills). 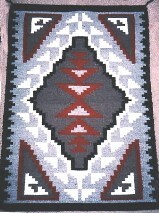 Black Mesa Blanket, male side, 2nd limited numbered edition, 80 in. x 64. in. Nos. 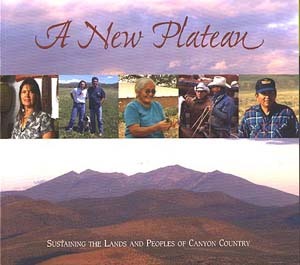 1-87 cosponsored by and available at the Heard Museum, Phoenix, Arizona. Deep midnight blue, rich "Ganado" red, warm wheat, and warm tan, 100% Churro weft from our 2008 7th Annual Black Mesa Navajo-Churro Wool Buy, containing entire 2008 and some 2007 white Churro shearing (©2008 Black Mesa Weavers for Life and Land, Inc. All rights reserved. Photos of 2nd ed. 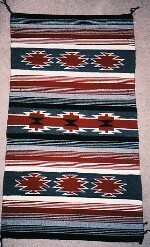 blanket courtesy Heard Museum. 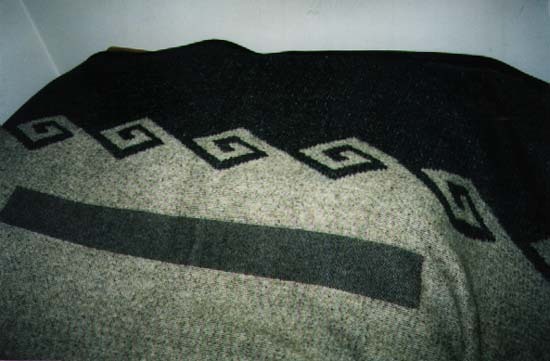 Produced by Pendleton Woolen Mills). 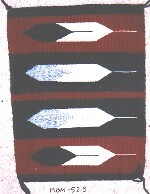 The Heard Museum of Native Cultures and Art in Phoenix, Arizona, has cosponsored our 2nd limited numbered edition of the Black Mesa Blanket.Without the partnership of the Heard, which has done so much to preserve and encourage the visions of indigenous peoples, this Black Mesa Blanket would be just a dream, and we are deeply grateful for their support and encouragement. Thanks also to the caring and generosity of many people who helped make it possible, the white fleece of every Churro sheep from our 2008 7th Annual Navajo-Churro Wool Buy, and some from 2007, has been woven as the weft. 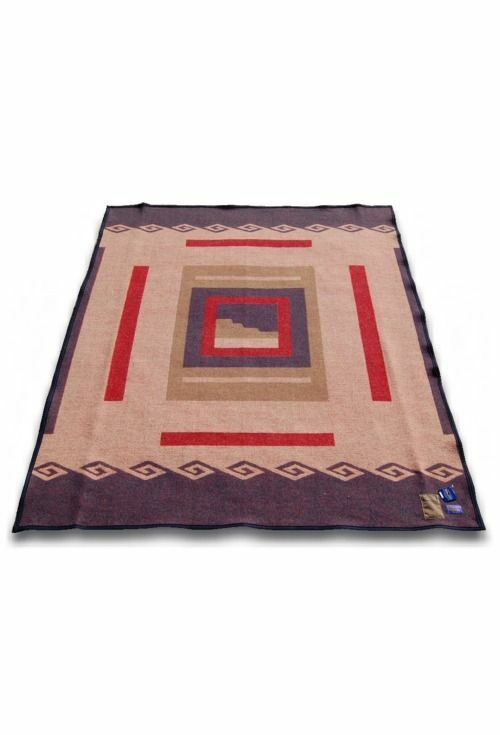 We are proud to again join with Pendleton to produce this historic blanket. Now it comes to you from all of us with appreciation for your support of a sustainable way of life, which cares for the Earth and its future. 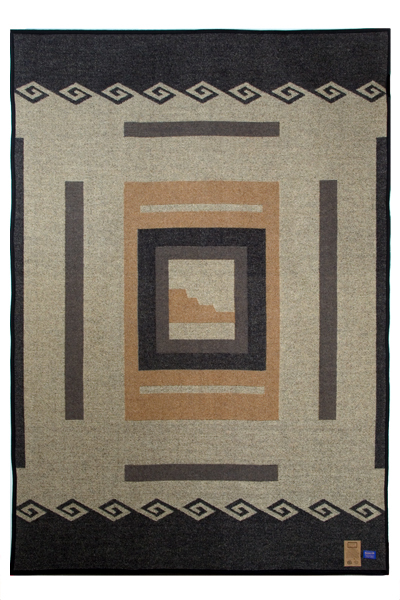 Our profound thanks to everyone who has bought our Black Mesa Blankets this year. We hope they kept you warm in past winters. Having held our 8th and 9th Annual Navajo-Churro Wool Busy in 2010 and 2011, and thanks to the generosity and support of the Christensen Fund and the sponsorship of the San Jose Museum of Quilts & Textiles, we have again been able to produce a 3rd and final numbered limited edition (same colors as 2nd ed.) 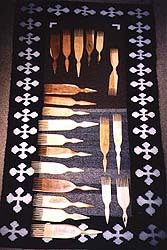 of these unique and rare all-Churro weft blankets together with Pendleton Woolen Mills. 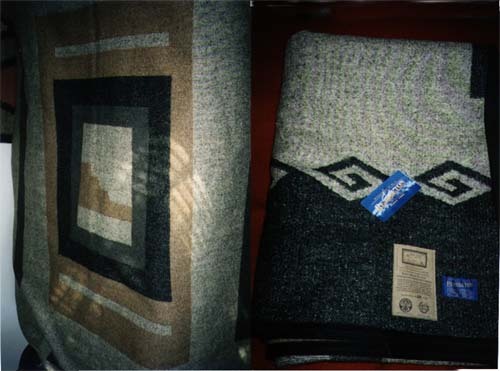 This very limited number of Black Mesa Blankets (there was only enough white Churro wool from the 2006 shearing to produce 141 blankets) is currently available for sale in the gift shops of both museums, through our organization, and in the Pendleton Home Store, in Portland, Oregon. The blanket is all-Churro weft. 80 in. x 64 in. It has been a pleasure and an honor to work with all the wonderful people we have met along the way in this adventure. Ahe'hee'--Thank you all. 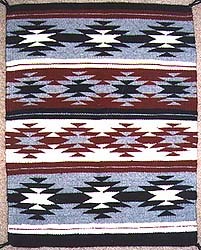 Ahe'hee'--Many thanks to everyone who bought a blanket in 2007, 2008, 2009, and 2010. 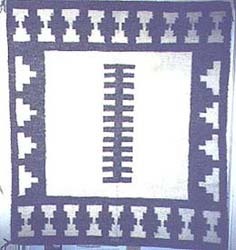 Thank you for your help in these terrible economic times for our country and the world by purchasing these rare and historically unique blankets and weavings. 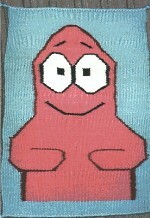 All our funds are currently invested in them, and in the 2007 Churro wool buy, which we were able to hold in June 2007. At our sixth annual wool buy, we could buy 2,000 pounds of Churro fleece from the Black Mesa area Dine'--because of your generous support and purchases of handspun weavings, handspun yarn, and the Black Mesa Blankets. And at out 7th Annual wool buy, we purchased 2,314 lbs. Though it's now summer, time of drought and prayers for rain, winter will still return, though the climate is changing and our planet is warming. 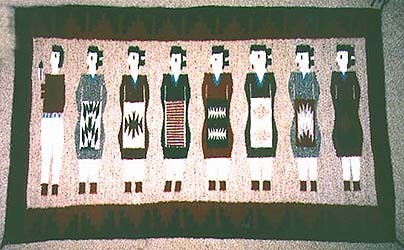 "In June 2005, at a Dine' culture fourth grade school program in Chinle, Arizona, the students examined the sample blanket. A boy put his hands on it, felt the wool, and said with a smile: 'It's good--it's warm!'" (Above, or on left) Female side. (Below, or on right) Male side (both photos courtesy and ©2006 David H. Davis). (80 in. x 64 in.) $349. 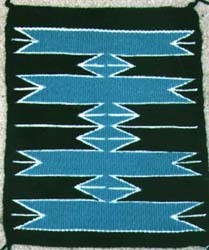 Water border and one of four directions, female side of blanket. 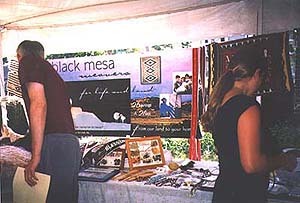 Female side: (on left) Black Mesa in center, surrounded by clouds, rain, and weaving tools (on right) blanket folded with storytag and logos. 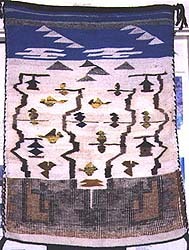 Black Mesa in center, male side of blanket. Since 2002, we have held annual wool buys, and in 2003 launched a wool-processing microenterprise for handspun Diné yarn. We are cooperating with other indigenous and nonprofit organizations to develop the community-based marketing of Navajo-Churro wool and mohair. We are also advocating for the development of renewable energy resources,the phasing out of fossil fuels, and the conservation and restoration of the aquifers that provide water to the entire region. On behalf of the entire advisory council/board of directors of Black Mesa Weavers for Life and Land, our profound thanks and deep appreciation for the kindness and generosity of everyone who made it possible for us to hold our 7th Annual Churro Wool Buy on June 5-6, 2009, at the Hardrock Chapter on Black Mesa. Our fifth annual Churro wool buy was held June 23-24, 2006, at the Hardrock Chapter, and we found that there were fewer churro sheep and thus less wool available this year than we were prepared to buy. We paid $1.90/lb. for raw fleece this year (again up from last year)--while local wool dealers were still paying about five cents/lb., or rejecting churro entirely! Thus, together with the USDA reimbursement of about 22 cents/lb., churro woolgrowers are getting at least $2/10/lb. for their raw fleece. The drought's effects, however, have resulted in less wool produced per average adult sheep--instead of 6.5 lbs. average fleece per adult, the average this year was more like 4 lbs. per sheep, as the animals conserved energy for their survival. The drought is catastrophic and unrelenting, and a manifestation of the extremes of weather patterns being felt throughout the U.S. and the world as global warming intensifies. Ahe'hee'--our thanks to the Hardrock Chapter for again hosting our wool buy, to all the people who worked so hard at the wool buy and afterwards, and to our field coordinator! Many thanks also to Teresa (from Navajo and Apache counties) and Calvin (from Coconino County) of the USDA/Farm Service Agency for again coming to Hardrock and registering the Dine' woolgrowers for the reimbursement program. 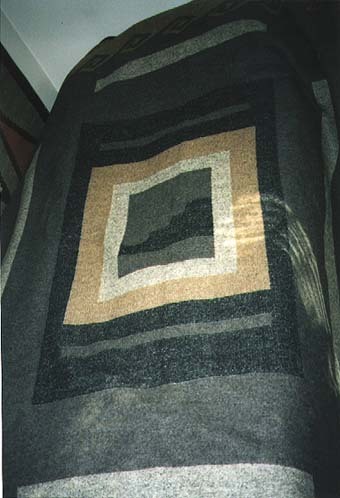 Below is a photo of a small blanket woven by Churro sheep raiser and master weaver Lorraine Herder, our field coordinator, and some of her dyed wool from which this blanket was woven. 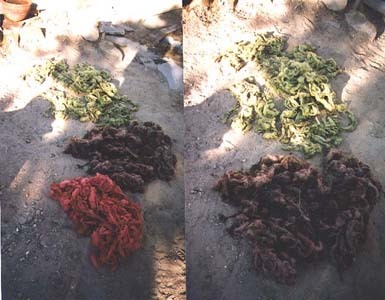 This weaving is a record of many of the vegetable and natural churro colors traditional in Dine' weaving--vegetation that is fast disappearing or already almost gone in this devastating drought. Marykatherine Smith, of Big Mountain, can no longer offer her HerbsWerk(tm) products for sale because the plants have dried up. Hay--costing $11/bale (and more in some places)--is almost all the food there is for the livestock to eat, and water must be bought, paid for, and hauled many miles for the animals and for people just about daily. With the beginning of a good rainy season late this summer, which seems to be continuing as winter begins in the region, we hope that the plants, trees, and grasses will be restored and renewed for next spring. We are fortunate to have a good amount of this vegetable-dyed handspun yarn (see the "wool for sale" page--click on "Wool" above) and natural colored yarn for sale, as well as the weavings below. We are also producing another, smaller run of the Black Mesa Blanket and hope to have it available in time for the holiday season this winter. 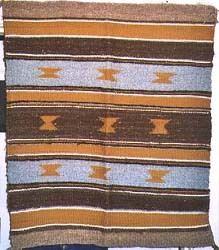 You can still buy this first edition rare and historic blanket through the Navajo Nation Museum, as noted above. Thank you for your support of our fair trade endeavors, helping to sustain endangered but still enduring lifeways. Navajo Vision: Art, Land, and Justice--Exhibit and sale of weavings at Meredith College, Raleigh, North Carolina, March 5 through April 9, 2006. August 2005: We are honored to have recently received this beautiful, handpainted bowl from the Center for Sustainable Environments, Northern Arizona University, Flagstaff, Arizona, acknowledging our participation in the work to sustain lifeways, water, and land on the Colorado Plateau. Ahe'hee'--Thank you! 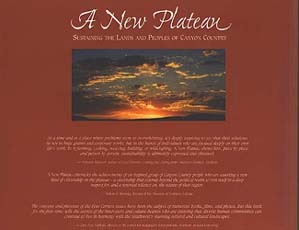 Buy the book, "A New Plateau" to learn about 38 organizations and people engaged in many aspects of this crucial work. 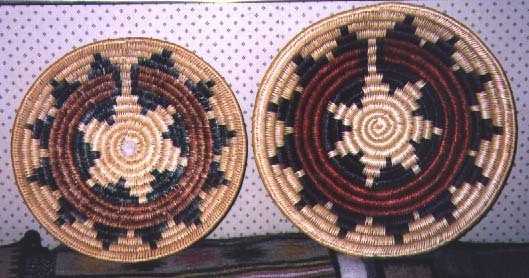 or email: carol@blackmesaweavers.org to place an order, or for more information. Or call toll-free 866-4-CHURRO (1-866-424-8776) Boston/Eastern time 10 am to 7 pm. 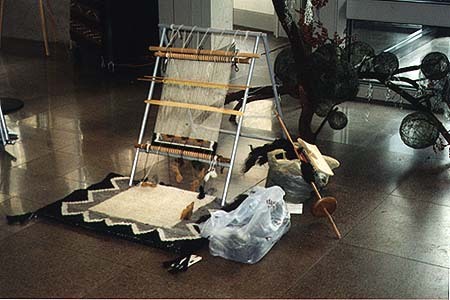 Portable loom with weaving begun, a bag of dark brown churro wool, and Dine' spindle with handspun yarn, James A. Michener Art Museum, Doylestown, PA, December 9, 2001. 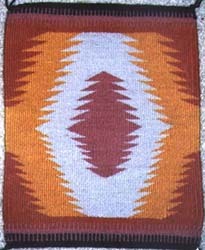 An "empty field" saddle blanket of handspun churro wool by Betty Nez (see MBM-209 and MBM-210, above) is folded under the loom where the weaver sat while weaving. "New Release! A refreshing look at 38 'modern pioneers' in the Four Corners region who have found ways to make a living while enriching their communities, economies and lands." The first chapter in Section Two, Ranching, is "Sheep Is Life: Dine' Be'iina and the Black Mesa Weavers for Life and Land," by Gary Paul Nabhan, pages 52-55. Available in hardcover and softcover from Renewing the Countryside, Minneapolis, MN. July 18, 2005: On behalf of Black Mesa Weavers for Life and Land, we want to publicly express our gratitude and appreciation to the Arizona State Museum and to Martin Kim, the director of the "Native Goods" museum shop and his staff, for their support and encouragement in selling our weavings in a fair trade nonprofit context since October 2004 until July 2005. 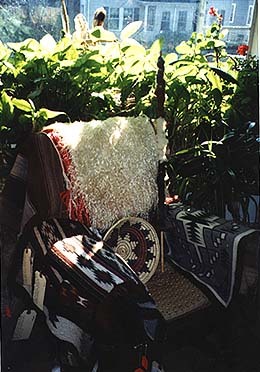 The sales generated by their efforts have had a major impact that has significantly benefited the individual weavers and our organization, and helped expand awareness of the importance of fair trade pricing to sustain the Dine' (Navajo) weaving tradition that we hope will continue to grow and become the norm for the sale of all American Indian arts. Ahe'hee'--Thank you! Gallery, the Stocker Foundation, and many generous individual contributors. Members, Preview--Friday, October 22, 2004--6:30. 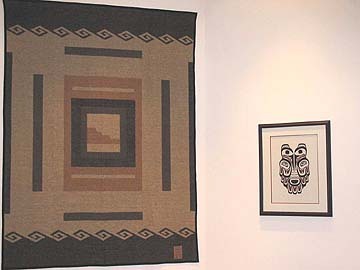 - 8 p.m.
NAVAJO RUG SALE in NATIVE GOODS [Museum shop]: Black Mesa Weavers for Life and Land Contemporary rugs from the Black Mesa area were on sale at special prices in the museum store," until July 2005. Our thanks to everyone who came to the 2004 Cultural Survival Winter Bazaar and helped make it a success for all! "The Cultural Survival Bazaar brings together the work of dozens of skilled artisans and craftspeople from around the world in one place. With each step you take, the sights, smells, and sounds will transport you to a time and place in another land. Our members and friends come back year after year for this colorful event," said Pia Maybury-Lewis, bazaar organizer and a co-founder of Cultural Survival with her husband and Harvard anthropologist, David Maybury-Lewis. Over 50 vendors offered their wares for sale. A percentage of the proceeds of each sale will support Cultural Survival's work with indigenous cultures worldwide. 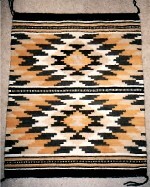 -- the sample "Black Mesa Blanket"(tm) designed by the Dine' and being produced of 100% churro weft together with Pendleton Woolen Mills in a limited edition of 250, cosponsored by the Navajo Nation Museum and the Museum of Northern Arizona: A historic first, and we are accepting preorders. ...Under the big white tent. 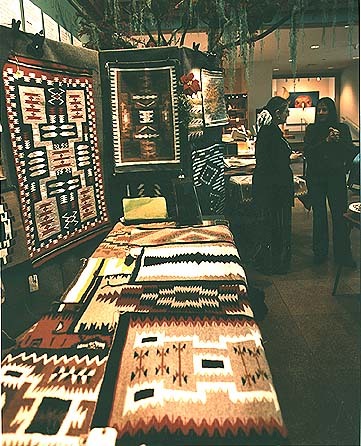 We were there with weavings, handspun Navajo-Churro weaving yarn, freshly sheared Churro wool, handmade weaving tools, jewelry, and more..
At the James A. Michener Art Museum, Doylestown, PA, December 8, 2001. Photo © by Marianne Ham. 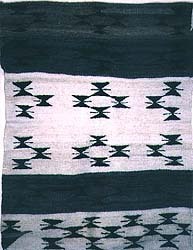 Dine' (Navajo) weavings are conceptual maps and abstract images of correspondences among the many aspects of their worldview--cultural and individual. 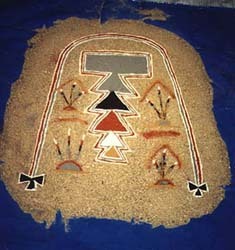 They represent/recreate the cosmos, the geography and landscape of Dine' Bike'yah (Navajoland), and the body, incorporating many of the symbols and relationships seen in the ephemeral sandpaintings created for ceremonial/healing purposes. Many ideas for weavings come from the subtle and dramatically striped rocks, buttes, and rock patterns that are constantly changing in the varied light of the high mesa country of Dine' Bike'yah. Sandpainting by Norris Nez and Henry Yazzie, Cultural Survival 30th anniversary festival and bazaar, May 18-20, 2002. We celebrated the 30th ANNIVERSARY CULTURAL SURVIVAL SPRING BAZAAR, May 17, 18, 19, 2002, in the big tent on the green in Harvard Yard, Cambridge, MA (between the Science Center and Sanders Theatre). Four Dine' came from Black Mesa as guests of Cultural Survival and Black Mesa Weavers for Life and Land: Norris & Lena Nez and their daughter and son-in-law, Irene Nez and Henry Yazzie. Norris Nez is a hataali (medicine man) and Lena Nez is a superb weaver; Henry Yazzie is an apprentice hataali and a fine silversmith. There were demonstrations of drypainting (sandpainting), carding and spinning of churro wool, weaving, traditional jewelry making, and song. 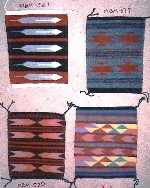 Weavings shown here (and more) were for sale as well as handmade silver and turquoise jewelry. Until Dece,ber 31, 2005, Black Mesa Weavers for Life and Land was a Special Project of Cultural Survival and we were honored to have been part of this festive celebration of Cultural Survival's 30th Anniversary. As of January 1, 2006, we have incorporated as a nonprofit organization in Massachusetts. 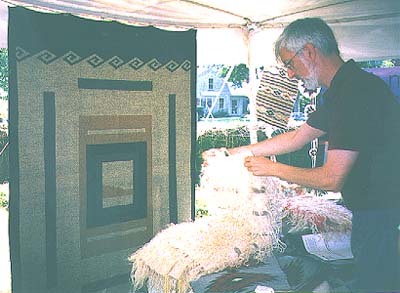 This is me, selling weavings at the Cultural Survival Bazaar, Harvard University, Cambridge, MA, April 28-30, 2000. 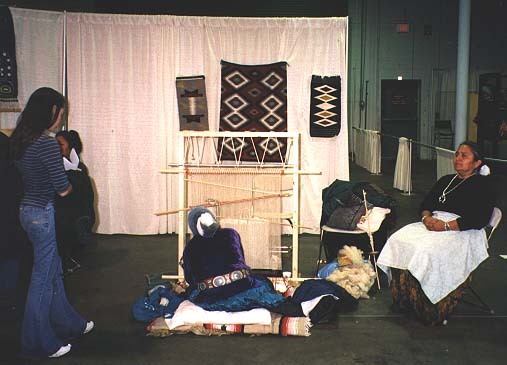 Student visitor watching Glenna Begay (weaving) and Esther Yazzie-Lewis (interpreter) at the International Festival in Boston, MA, October 1999, under the auspices of Cultural Survival and Black Mesa Weavers for Life and Land. or email : carol@migrations.com to place an order, or for more information. Or call toll-free 866-4-CHURRO (866-424-8776) Boston/Eastern Time 10 am to 7 pm. 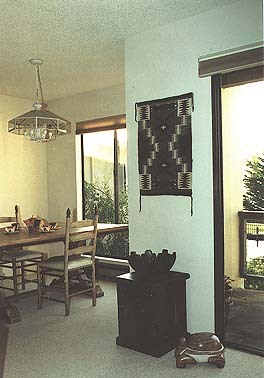 Weavings, spindle, ceremonial basket and sash, plants, and wild turkey feathers in my livingroom. or email : carol@migrations.com to place an order, or for more information.Or call toll-free 866-4-CHURRO (866-424-8776) Boston/Eastern Standard Time 10 am to 7 pm. 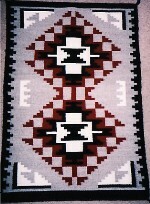 Copyright © 1998 -2013 Carol Snyder Halberstadt, Black Mesa Weavers for Life and Land, Inc. All rights reserved. 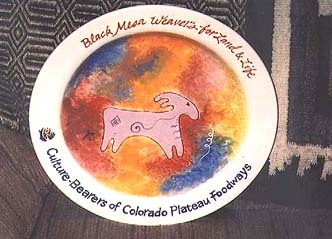 Black Mesa Weavers for Life and Land , "Fair Trading from the Source," and "From Our Land to Your Home" are trademarks of Black Mesa Weavers for Life and Land, Inc.